This small waxwing has broad and pointed wings, a short tail, a large head and a short but wide bill. Its head is pale brown with a black mask outlined in white, its belly pale yellow and its wings soft grey with red wax-like tips. Cedar waxwings seek out open woodlands, orchards and residential areas. At mating time in June every year, a pair of cedar waxwings return to the trees on our property in the Gatineau Hills of Quebec. They set up house among the branches of an old Manitoba maple tree just in front of my second-floor sunroom window. From this vantage point I can watch the comings and goings of the male and female and see their offspring emerge from the nest. I have become a great admirer of the cedar waxwing’s perfectly groomed, sleek beauty-- not a feather ruffled-- and I would propose it as the national bird for Canada. The most distinctive feature of the waxwing is its black “Zorro” mask accentuated by a sharp white outline. Its other identifiable characteristic is the small crest of feathers, brushed back over the bird’s head neatly like a 1950s hairdo, as if permanently fixed by the wind. About 18 cm long, the waxwing is smaller than a robin, and more attenuated in form, without the chubby breast. It is not a flashy bird (appropriately Canadian), but its colouring is not altogether discrete either, with the bright red spots on the wing tips and a dash of vivid yellow along the edge of the tail. These highlights of colour and touches of white here and there, contrast with the brown, cinnamon tone of the main body and pale yellow belly. 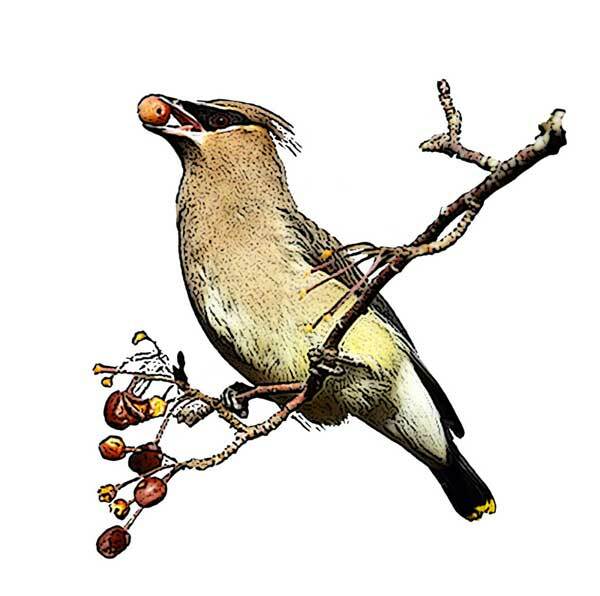 The waxwing’s well-defined colouring and attenuated silhouette make it a perfect subject for a graphic image. A woodland bird, the waxwings are attracted to the plump red berries of the honeysuckle bushes in our area of fields and forests. Its fluid, ringing zzzzz…call announces its arrival in late spring across Canada. Like so many human Canadian “snowbirds,” the cedar waxwing avoids our winters and returns from the south suntanned and sporting a colourful shirt, ready to appreciate the fruits of summer. a flock of hundreds of waxwings all converging on a berried tree in the middle of winter, a sight to behold. The cedar waxwing is simply the prettiest bird to regularly visit my garden. The Cedar Waxwing stays in CA Ada in the winter. It is a highly social bird that thoroughly enjoys fruit. I love the Cedar waxwing, they cheer up the cold grey winter and spring days, with their huge flocks and gay banter. if we could all vote the cedar waxwing and then tell our friends about the national bird project and how to vote and then they vote for the cedar waxwing and then we tell our relatives and then they tell their friends and family and it goes on and on we could fly our way up to the national flag and chirp away!!!!! I have picked this majestic bird because I have seen it before but more important if we just raise 104 votes and a few hundred more we could make it be higher up in the top 40 because Hey, who doesn't like a Cedar Waxwing??? it's on Canada!!! If you go out and see one you'll know what I mean. The Cedar Waxwing is readily identifiable whan seen and has been my favourite bird for as long as I can remember which, considering I was born in 1948, is a very long time. It's crested head sleek body and wonderful yellowish colour including the small red highlights all lend to give it a regal appearance. For years I would watch them flock to my flowering crabapple trees in the spring feeding on the small apples (seed pods) that had survived the winter. They have a distinct song that is sweet to the ear. They are not bully birds! These birds can be spotted in most, if not all, of our great country. I had never seen this bird until recently and it is one of the most stunning birds I've ever seen. Le jaseur d'Amerique, Cet oiseau est vraiment beau, et de plus son instinct grégaire représente la force et les avantages à être ensemble , se tenir ensemble . Unis pour être plus forts. Comme les canadiens devraient être, dans un monde idéal. Voilà. J'ai hâte de connaître le vainqueur. C'est un bel oiseau. Il a ses petits plus tard que les autres. On l'entend constamment et il est beau! I too think this beautiful bird of Canada deserves more votes. Delightful flocks of colourful birds, sometimes sharing a berry and passing it along the line. All Canadians have an opportunity to see these lovely birds. The Cedar Waxwing is a beautiful creature. I love watching these social birds flock to a pine across the street. Their songs are enchanting; their colors are vivid and appealing. Waxwings are not pests - so why not vote for this extraordinary bird? The sleek-bodied Cedar Waxwings highly deserve the honor of being Canada's National Bird. The Cedar Waxwing is a beautiful bird with lovely sounds. Votes should be higher for this bird. One of the most beautiful birds! We have a quite a few of them in our backyard and it is a delight to listen to their calls and see them in flight! They're one of the most unique and easily identifiable birds in Ontario. Their colours are beautiful: from the waxy red secretions found on the tips of the secondaries to their yellow tail tips. I always enjoy watching them fly after they have become intoxicated on berries. I love the calls they make. Cedar Waxwings are my favorite birds because they remind me of a group of bandits stealing fruit off of fruit trees. I love their black masks and their head crests. Canada deserves to have this bird as its national bird! I love this bird for its "mohawk" hairdo, its sleek belly and its touches of yellow and red. Every spring, a flock of waxwings would descend upon my flowering crab to eat the remnants of the previous year's berries. Sadly, my flowering crab had to be cut down after being damaged during the ice storm and I no longer get to admire my delightful visitors. A striking bird with unique wax-like tipped feathers and charismatic social behaviour - travels in excitable groups. This is a nice bird, up at dawn and off by noon. C'est un bel oiseau présent à la ville comme la campagne. De plus, il est chanteur et sociable aimant se déplacer en groupe. Enfin,sa taille est remarquable et se coloris agréables à regarder. Il nou ferait un oiseau emblématique représentant bien notre beau pays. I like the idea of our national bird being fairly common year-round. Easy to spot in urban or rural areas, The Cedar Waxwing can be seen in most of Canada. Attractive to look at and friendly to people, this bird has a pleasant voice that makes you want to look. How wonderful to see a flock of these any time of the year! Its good for a national bird of Canada. 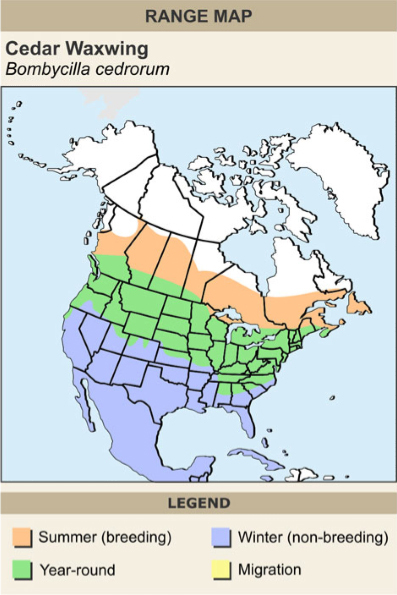 Cedar Waxwings live in all provinces of Canada. I find the Cedar Wax Wing to be plentiful and a more people friendly. il résiste au grand froid canadien. Quel oiseau magnifique! C'est un bonheur de le voir arriver, en groupe, pour se nourrir dans nos cormiers alors qu'au sol, un tapis de neige recoît les particules de fruits rouges! Après tout, mon pays c'est l'hiver! J'adore les voir lorsqu'ils arrivent et se nourrissent à nos amélanchiers canadesis. On voit le Jaseur à toute saison et particulièrement en hiver près des maisons, dans les pistes de ski de fond ou de raquette, quand il coure les petits fruits séchés. Cet oiseau vit avec nous toute l'année. En hiver, en raquette on l'entend avant de les voir, il se tient en groupe. C'est beau de les voir arriver pour se nourrir dans un arbre à fruits tel que pimbina, pomettier durant ou au début du printemps. À l'été je l'ai vu dans des cèdres. Pour moi c'est un très bel oiseau qui vit avec nous toute l'année, grégaire et quand on le regarde de près d'une grande beauté. J'aurais choisi le Cardinal rouge, mais puisque ce n'est pas possible, le Jaseur d'Amérique m'apparaît le meilleur choix. C'est un oiseau tout simplement magnifique qui n'a pas peur du froid! Ever since I first saw and heard Cedar Waxwings by a pond in the depths of our Newfoundland boreal forest, I have been impressed with the beauty and energy of these birds, and think they are worth a vote. Elusive, but very beautiful. The feathers are so colourful. Very subtle like the bird. A beautiful, gentle bird that has chosen Canada as it's breeding ground. This bird is common all over Canada, it is gorgeous, elegant and seems proud. Always a thrilling sight to see a gang of them flock to a tree and start yakking to one another. In French, we call them "jaseur d'amérique", and they do indeed "jase ". Je vote pour ce bel oiseaux parce qu'Il vit dans des milieux très variés, fréquentant tous les endroits où croissent des arbustes à petits fruits. Il s’accommode aussi bien des forêts de feuillus denses ou clairsemées que des forêts en régénération. On peut aussi le voir en bordure des habitations, dans des vergers ou à proximité des lacs, rivières, marais et tourbières. So beautiful when in the sights of the binoculars. They form little teams and fly high together - just like the spirit of Canada. The cedar waxwing is gentle, kind and co-operative. He is responsible for planting many fruit trees (berries and cherries) and controlling many insect populations. Although the blue jay is more recognized, it is loud, raucous and bullying, and I don't like to think of Canadians that way. Travels and works together. Works in shifts to insure fairness to the rest of the flock. Handsome and regal.